Fun With The Dunns: Dust & Jen Plus Ten!! Dust & Jen Plus Ten!! Ok, so we're not quite on number ten, but we're well on our way! 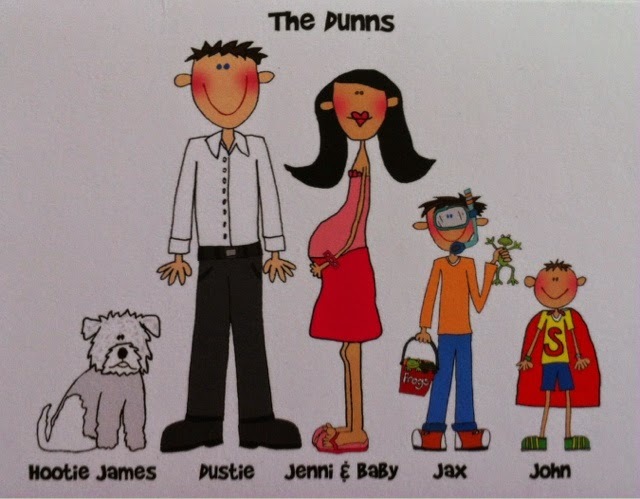 We are expecting Dunn Baby #3 in February 2015! Yes, we were trying for baby #3, but I was not expecting it to happen so quickly. We tried to get pregnant with John for a year, so I thought it would take a little while at the least. This pregnancy has been super different so far. I was only sick for a few days of one week. My biggest clue as to something going on with me was my sudden tiredness. For a few weeks there I wanted to take a nap every day & that was unlike me. So, a few weeks ago I took a home test & it quickly said, "Pregnant." I had to find a doctor here in Hattiesburg & call them to make an appointment. I had to plan it around our Branson trip. So, by the time I see the OB, they give me an ultrasound & tell me that I'm 12 weeks!! We were shocked to be that far along, but I was super excited b/c I was almost out of the first trimester! I'm 14 weeks this week & other than being more tired than normal, I'm feeling great! Poor bloggy has been neglected lately. I have a couple of catch-up posts to do. We squeezed in a Branson trip before school started for Mimi & have been running around non-stop since then. We are getting the boys ready to go to their new Preschool here in Petal & next week we will be joining our Senior Adults on their retreat!